October is International Walk to School Month, and we are ready to celebrate Bryant’s walkers. On Friday mornings of Oct 2, 16, and 23, come jump on a walking school bus. 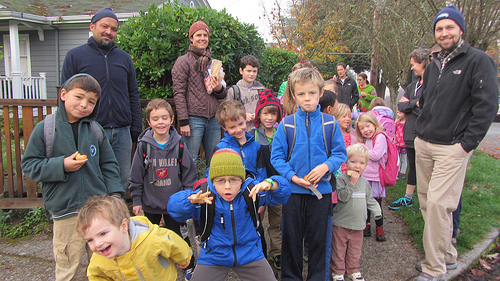 A walking school bus is a group of parents and kids who walk to school together. Parents can walk with their kids or drop them off and let them walk with the group. 9:00 am Gather at one of the 4 meeting points. Meet other Bryant parents and kids while enjoying a fall time treat. 9:10 am Start walking to school along the routes outlined in blue. Information about Seattle Public Schools Advanced Learning program can be found at the District’s website. Welcome to DJ Wilson, our new Playground Supervisor! Join (or renew) with the Bryant PTSA today! Build a partnership between our school and our families. Vote on the Bryant PTSA budget, on resolutions, and for the Bryant PTSA Executive Board. Help fund PTSA scholarships and grants. Provide a legislative voice for our children in Olympia and in Washington, D.C. Your PTSA membership needs to be renewed every year. Hit the ground running this year. Download your membership form today and have your membership ready to go.